Schematic cross section of the San Andreas Fault Zone at Parkfield, showing the drill hole for the San Andreas Fault Observatory at Depth (SAFOD) and the pilot hole drilled in 2002. Red dots in drill holes show sites of monitoring instruments. White dots represent area of persistent minor seismicity at depths of 2.5 to more than 10 km. The colors in the subsurface show electrical resistivity of the rocks as determined from surface surveys; the lowest-resistivity rocks (red) above the area of minor earthquakes may represent a fluid-rich zone. Building on more than 15 years of experience from the Parkfield Earthquake Experiment, the National Science Foundation (NSF) and the USGS started in June 2004 to drill a deep hole in order to install instruments directly within the San Andreas Fault Zone near the initiation point of previous magnitude 6 Parkfield earthquakes (drill hole location in relation to slip rate). These instruments, set 2 to 3 km beneath the Earth's surface, will form a San Andreas Fault Observatory at Depth (SAFOD). This project will directly reveal, for the first time, the physical and chemical processes controlling earthquake generation within a seismically active fault. Drilling the hole for SAFOD starts west of the San Andreas Fault and then use advanced directional-drilling technology developed by the petroleum industry to angle the hole through the entire fault zone until relatively undisturbed rock is reached on the east side. Fault-zone rocks and fluids will be retrieved for laboratory analyses, and geophysical measurments will be made within the active fault zone. SAFOD's long-term monitoring activities will include detailed seismological observations of small to moderate earthquakes and continuous measurements of rock deformation and other parameters during the earthquake cycle. SAFOD will provide direct information on the composition and mechanical properties of rocks in the fault zone, the nature of stresses responsible for earthquakes, the role of fluids in controlling faulting and earthquake recurrence, and the physics of earthquake initiation and rupture. By observing quakes "up close," SAFOD will mark a major advance in the pursuit of a rigorous scientific basis for assessing earthquake hazards and predicting earthquakes. PBO is a geodetic observatory designed to study the three-dimensional strain field resulting from plate boundary deformation. SAFOD is funded by NSF as part of an ambitious scientific initiative called EarthScope. The other elements of EarthScope include USArray, and the Plate Boundary Observatory (PBO). USArray consists of a large transportable broadband seismic array, augmented by smaller seismic arrays and coordinated with the USGS Advanced National Seismic System (ANSS). The PBO is a network of deformation sensors (GPS and strainmeters) for the western United States similar to that deployed at Parkfield. Support for scientific studies using SAFOD and the other EarthScope facilities will come through programs within NSF, USGS, NASA, and several foreign countries. A 2.2-km-deep vertical pilot hole was drilled adjacent to the San Andreas Fault at Parkfield in the summer of 2002. This pilot project was funded by International Continental Drilling Program, with considerable logistical and scientific help from the NSF, and USGS. The pilot project has provided both engineering and scientific data to guide the current SAFOD project to its goal of precisely drilling into the fault-zone where small, M2, earthquakes repeat on a regular schedule. More information and daily news from the drilling can be found at the ICDP SAFOD website. The cooperative efforts of USGS and other scientists in the Parkfield Earthquake Experiment and SAFOD will help achieve a better understanding of what happens on and near a fault during the earthquake cycle and will aid in predicting the time and severity of future quakes. This work is part of the National Earthquake Hazard Reduction Program's ongoing efforts to protect people's lives and property from the earthquakes that are inevitable in California and elsewhere in the United States. 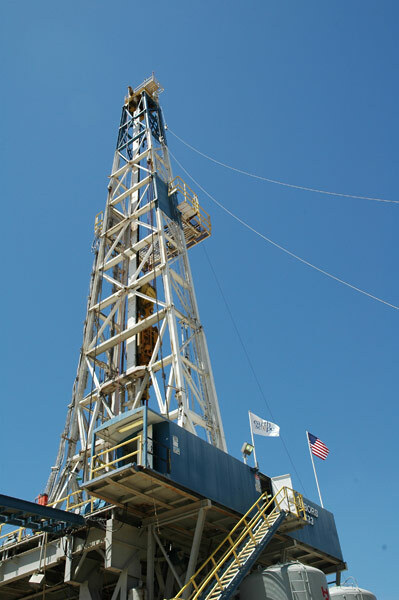 SAFOD drill rig, July 2004. Photo courtesy Earthscope-SAFOD.